Welcome to another March 2013 issue of GL's Newsletter providing information and insight into our latest enhancements to MAPS™ UMTS IuPS Interface Emulator. In essence, UMTS IuPS is the Gateway to the World Wide Web. More precisely, IuPS, as shown below, is the interface between the RNC (Radio Network Controller) and the SGSN (Serving GPRS Support Node). It's what makes smartphones "smart", and a giant step in mobile technology evolution, dramatically changing the way we work and play. UMTS, or Universal Mobile Telecommunications System is a 3rd generation mobile technology – evolved from GSM technology. It uses W-CDMA (Wideband Code Division Multiple Access) radio access. With increased spectral efficiency and high bandwidth, UMTS can support broadband data, voice, and video. The underlying transport for UMTS in the core network can be Asynchronous Transfer Mode (ATM) or IP. UMTS supports integrated services such as multimedia and global roaming to mobile users. SGSN manages mobile location whether within the carrier's network or roaming outside. Once a user turns on his or her mobile, a new IP address gets assigned and IP connectivity is available with quality of service (bit rate allocation) based on subscription, and tunnels are created for mobile flows to/from that mobile. These data tunnels carry encapsulated traffic such as http, ftp, email, etc. SMS may also be carried by the signaling plane to/from the mobile. IuPS emulation and analysis can be very important in the design, verification, and troubleshooting of a carrier's mobile data network. GL's Message Automation & Protocol Simulation (MAPS™), is a protocol simulation and conformance test tool that supports a variety of protocols such as SIP, MEGACO, ISDN, SS7, GSM, LTE, and many other TDM, IP, and Wireless protocols. MAPS™ has been enhanced for testing UMTS IuPS interface. It can simulate RNC (Radio Network Controller), and 3G SGSN (3G Serving GPRS Support Node) by generating RANAP and DTAP signaling messages over SCTP as Transport layer in an IP network as defined by 3GPP standards. MAPS™ provides users the unlimited ability to edit messages and control scenarios (message sequences). "Message sequences" are generated through scripts. "Messages" are created using message templates. Call Generation option allows the user to simulate outgoing communications where an outgoing call is initiated by sending call control messages using proper scripts and profiles. The profile allows necessary parameters of call control messages to be changed during runtime. Messages are exchanged between MAPS™ and the DUT. MAPS™ application acts as either the Caller or resides at the network terminal acting as Callee. In this document, we are considering the call flow between the RNC and SGSN nodes for Attach Request and Routing Area Updating (RAU) procedures. As depicted in figure below, MAPS™ - IuPS acts as RNC processing the call flow and responds to messages from SGSN Node. The MAPS™ initiates the Attach Procedure by sending Attach Request to the DUT (SGSN). The DUT on receipt of ATTACH REQUEST message should send a CC connection confirm message in response as shown in the figure below. Call generated from another entity can be automatically detected in call reception window by setting the required scripts against expected messages in the Incoming Call Handler window. As seen in the figure below, MAPS™ acts as SGSN, and tests the DUT that is configured as RNC. This test is performed to ensure that the MAPS™ (SGSN) on receipt of ATTACH REQUEST message from RNC, sends a CC connection confirm message in response. MAPS™ responds to the messages received from RNC and then completes the call flow. 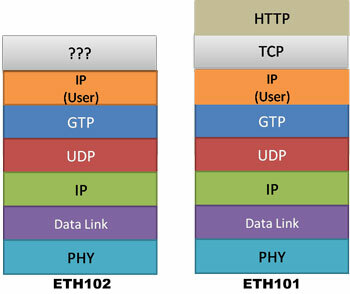 Mobile Traffic Core - GTP (ETH101) - This module supports user-plane packet transmission and reception services between any two nodes (GTP-U protocol entity) in UMTS (SGSN, GGSN, RNC), and LTE (SGW, PDNGW) networks. This module can support generation and verification of data traffic such as Email, FTP, Web (HTTP), Video, and more. This module also allows simulation of multiple users accessing a Web server simultaneously. Mobile Traffic Core - Gateway (ETH102) - This module allows simulation of Gateway and transfers user plane data from RNC to GGSN. It handles GTP tunnels on both directions of SGSN. It can also act as GGSN for userplane traffic by encapsulating IP traffic over GTP. By default, all call handling scripts (irrespective of the type of the functions) are assessed by MAPS™ to provide statistical information about Total Calls, Active Calls, Completed Calls, Passed Calls, Failed Calls, and Calls/Sec . It is also possible to characterize the statistical information under different groups of call handling scripts under a unique heading. In addition, Call Generation and Call Reception windows provide useful call status & script execution results. For comprehensive information on the application, you can refer to the MAPS™ UMTS IuPS Interface Emulator web page.